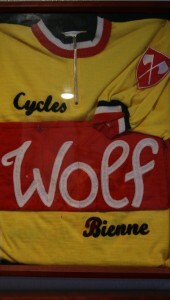 A 1950-60’s Wolf Jersey with beautiful chain stitch lettering. Chain stitch lettering a more labor intensive lettering style dissappeared from cycling appearel in the early to mid 1960’s going to a brushed velet lettering which was much easier and less costly to apply. This was also the end of the older handcrafted look to jerseys and bike grafics with the 1970’s ushering in a bold simple style of grafics to bicycles and clothing.